This year, Superior Charters celebrates 40 years of sailing excellence. About 80% of the company’s clientele are repeat customers – a testament to the quality of service they offer. If you want wilderness cruising in the Apostle Islands, you can’t go wrong with this boat charter. Different folks want different cruising experiences, which is why Dreamcatcher Sailing offers diverse options for visitors. Would you prefer a day of adventure? Take the five-and-a-half-hour Apostle Island Discovery tour. Want a quick tour of the bay before heading out for dinner? Book the one-hour-fifteen-minute Happy Hour tour. 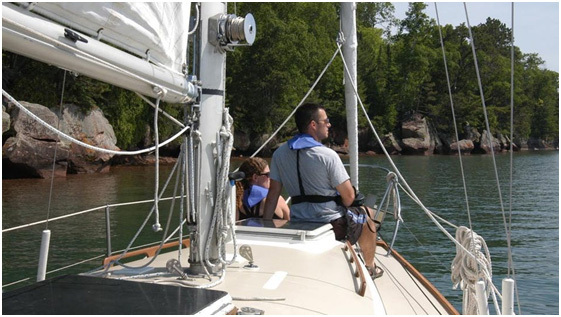 Manitou Sailing Charters has a classic wooden yacht, which makes for an exciting yet sophisticated sailing experience. The yacht is a 33-ft. Acadia ketch and is also commonly used as a venue for weddings and other special events. All boat captains are U.S. Coast Guard licensed, and you can choose from a three-hour day sail trip, a three-hour sunset cruise, or a five-hour sail. This boating company gets its name from the Ojibway word which means “to sail away” – and that’s exactly what you’ll do on Animaashi’s 34-foot boat, Sarah’s Joy. At the helm of the ship is Captain Paul Bratti, a former Coast Guard officer. Trips can either be half-day or full-day, or you can opt for an evening cruise. Good Earth’s Captain Mike was born and raised in the Bayfield area and has sailed the Apostle Islands for some 35 years. With a local at the helm, you’re sure to see only the best destinations in the islands. And true to its name, Good Earth operates only newer vehicles that are suited for Lake Superior’s waters. Sailboats, Inc. knows a thing or two about certifying charter captains; since 1980, they’ve certified more than 11,000! Once you complete your training, you can rent a chartered water vessel without the added expense of hiring a captain, too. There’s no better way of exploring the Apostle Islands than on a ship you pilot yourself. We hope our recommendations will help you enjoy a truly unforgettable vacation in the Apostle Islands. Would you like to learn more about the area? Are you thinking about investing in property here? Call Windseeker Realty LLC today at (715)779-5000 or e-mail Agent(at)WindseekerRealty(dotted)com to know more.